The Vought XF5U-1 was a development of an earlier, smaller aircraft - the V-173. The V-173 first flew in 1942 and was designed to prove the concept of a twin-propellor, blended wing circular aircraft. The V-173 was a relatively basic prototype considering the complexity of the overall design. It featured propellors from the F4U-4 Corsair, two 80 horsepower engines, and a fixed undercarriage. However it served its purpose and showed that the design worked, therefore the green light was given to develop a full-size version. The XF5U-1, nicknamed the 'Flapjack' due to its peculiar shape, was a considerably more advanced aircraft than the V-173. Power came from two 1350 horsepower Pratt and Whitney R-2000-7 radial engines, and the four bladed propellors were custom built for the aircraft. 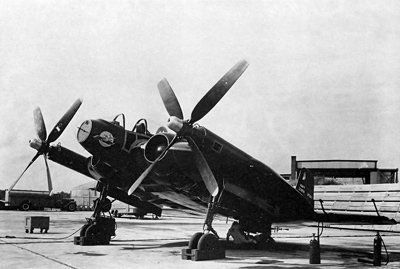 Additionally, whereas the V-173 had used a lightweight but flimsy construction technique which primarily consisted of a fabric covered wooden structure, the XF5U-1 featured a largely metal construction method. Due to this fact the XF5U-1 weighed an incredible five times the amount of the prototype. Two examples of the XF5U-1 were constructed and underwent extensive ground tests, including a few short hopping flights - but no full flights. From the outset the aircraft suffered from vibration problems. Unfortunately, due to the rapid advances in jet aircraft and more conventional rotor aircraft the engineers never had the time to correct the problem as the project was canceled in 1947 in favor of more modern aircraft. 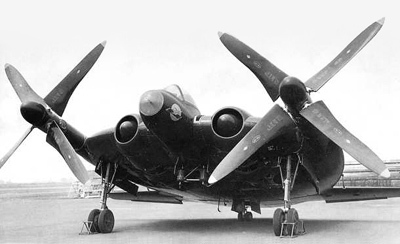 Both XF5U-1 prototypes were subsequently dismantled and destroyed. Thankfully however the V-173 was rescued and is now preserved by the Smithsonian.